Low Carb Luxury Magazine Special Edition: Pasta! In a large skillet, heat olive oil over medium-high heat and sauté garlic, onion, carrots, celery and mushrooms until tender, about 5 minutes; remove from heat. Transfer vegetables to another dish. Preheat oven to 375°F. Spray 13x9x3 baking dish with non-stick cooking spray. Spread 1 cup of low carb pasta sauce on bottom of baking dish. Layer 3 lasagna noodles, 1/3 of ricotta cheese, 1/2 of the meat mixture, 1 cup low carb pasta sauce, 1 cup mozzarella cheese. 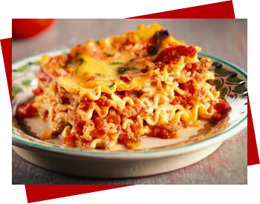 Layer 3 lasagna noodles, 1/3 of ricotta cheese, 1 1/2 cups low carb pasta sauce. Layer 3 lasagna noodles, 1/3 of ricotta cheese, 1/2 of the meat mixture, 1 1/2 cups low carb pasta sauce, 1 cup mozzarella cheese, 1/2 cup Parmesan cheese. Cover pan with foil and bake for 45 minutes. Remove foil and bake another 10 minutes. Let stand for 10 minutes before cutting. 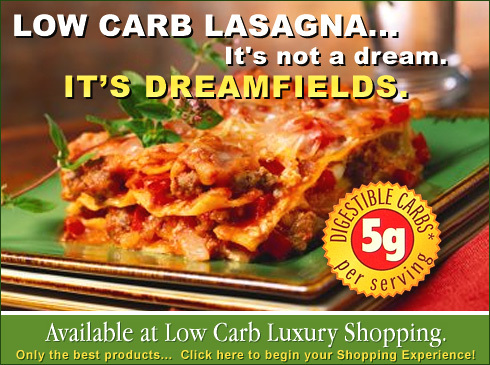 Copyright © 2006 Low Carb Luxury. All Rights Reserved.